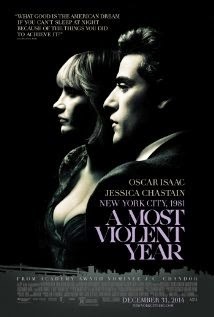 A Most Violent Year (2014), R, 125 minutes - Just about any sort of promotion leading up to the release of A Most Violent Year would lead you to believe that it is the most recent entry into the gangster film genre. But, while a couple of characters certainly have connections to that seedy underside of life, the film actually focuses on one man's efforts to avoid that lifestyle. That man is Abel Morales (Oscar Isaac), an immigrant owner of a heating fuel company in New York City in 1981 (statistically one of the most violent year's in the city's history). Over a few month period, hundreds of thousands of dollars worth of his company's fuel has been stolen by truck hijackers causing major complications in his business plans on multiple fronts. Abel finds himself juggling a police investigation into his financial dealings (thanks primarily to his wife's and business partner's connections), push back from the truck driver's union to arm themselves against the hijackings, the pulling of loan support from his long-time banker out from under his plans to purchase a water front property that would allow for great expansion, and the safety of his family. Despite the urging of others to handle things in a far more questionable way, he is determined to deal with what is thrown at him as morally as possible. He ventures into the gray once or twice in order to show his convictions, but never dives into that pool completely. Oscar Isaac gives a very good performance, portraying Abel's conflicts and determination convincingly. Jessica Chastain has a powerful turn as Abel's wife Anna, whose questionable book keeping practices and connection to her gangster father help lead to the police investigation led by David Oyelowo's Officer Lawrence. Abel's business consultant with a sketchy background of his own is played by Albert Brooks in the gray-area-operating type of role that he has become so comfortable in over the years. A Most Violent Year is a very good film from writer/director J.C. Chandor, it just isn't quite what the trailer makes it out to be. It is actually very refreshing to see the film not devolve into the bloodbath of violence that it very easily could have. If you're looking for a well made, well acted drama, you should be pleased with A Most Violent Year.